After working over E-Book management with Calibre and Pictures management with Google’s Picasa, here I am to discussion about managing and cataloging a large movie collection with another open source solution: Movienizer. 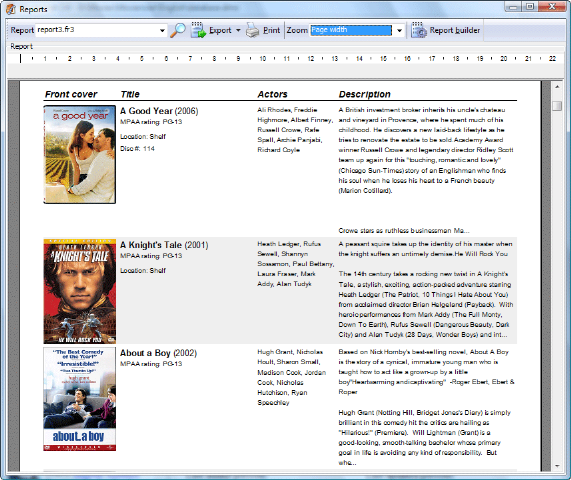 There are many usage for a movie organizer like keeping tracks of all your DVDs, CDs, Blue Rays, Cassatas etc, but here my intention was to find a software, which could scan through physical movie files and then could arrange the related info like actors, release date, snip set of story and ranking etc. So, that we could find the movies on the basis of actors, companies, ranking or genre based and that too without lots of manual efforts. Not only free software, but Movienizer has a smooth-n-simple interface and on top of that its so simple to use. With Movienizer you can easily find and collect information about your favourite movies. Do you like some actor/ actress? Want to find out where he or she is also starring? No problem, just launch Movienizer, select the actor/actress and click “download” button, you will get the complete list of movies with the given actor/actress, plus important information and photos. In the same way, if you want to learn more about some particular movie in the list? Again, you just need to click and “download”. Movienizer will help you keep track on everything concerning movies. Even this has a loan manager, which can keep track that whom you lending movies. Your personal rating system could advise you for watching some movie on some holiday. Not only this, but you could define movies that you want to see next, inform yourself about future projects of your favourite directors. There are lots of feature lying under hood of this open source software, which you will be exposed only on the basis of what you do with this. Personally, I found this one a great aid for me like Movie Maniac. Confused?? Is this of any use for you? Give it a try, if you have a large collection of English movies (as it fetch information with IMDB, so I guess not that helpful for Hindi movies) and a so so internet connection. Have you tried All My Movies? It is not free, but great! By the way, Movienizer now is paid software as well. it is still possible to use it for free, though unregistered vertion has some restrictions.